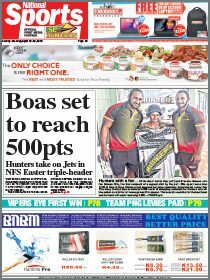 A BEAMING James Marape was welcomed back to Port Moresby yesterday by his wife and three sons after being declared the winner of Tari-Pori Open seat in Hela. The three-time MP hailed his victory – the first in this election for the ruling People’s National Congress Party led by Prime Minister Peter O’Neill – as a “strong testament to my people’s desire for maturity, stability and continuity of leadership”. Wife Rachael and sons Sabbath, James and Roy were on hand to welcome him back at Jackson Airport when he arrived from Tari. He said the big show of support by his people was because of the work he had done for them in the past 10 years. “My people have chosen an experienced hand so that what we’ve started as a province and a district continues, irrespective of the contrary views that many may hold in as far as the election is concerned,” he said. Marape was declared as Tari-Pori MP by returning officer Jack Walara at 11.30am yesterday after the elimination process on Saturday. He polled 30,192 to finish way ahead of independent candidate Johnny Pokaya Philip (14,556) and People’s Progress Party’s Justin Haiare (7924). Marape paid tribute to the people of Hela. “The good thing that has emerged amid the many negativities that surround the 2017 election is that Hela people showed up in huge numbers – beyond 80 per cent – at their respective polling places,” he said. 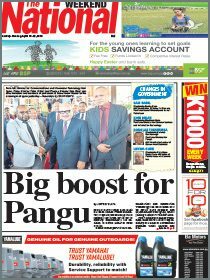 “Tari-Pori has been delivered, Koroba-Kopiago and Komo-Margarima are being delivered and winding down their counting, with declarations expected in my two sister electorates in the next two to three days, as well as the Hela provincial seat. “Hela’s election preparation has been spot-on by the election team on the ground. An elated Marape said Hela had shrugged off the negative views to deliver a successful election.